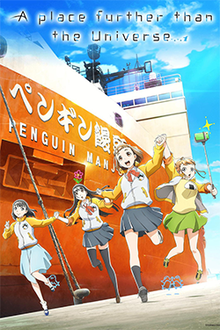 A Place Further than the Universe (Japanese: 宇宙よりも遠い場所, Hepburn: Sora yori mo Tōi Basho)[a][b] is an anime television series produced by Madhouse. The series is directed by Atsuko Ishizuka, written by Jukki Hanada and features character designs by Takahiro Yoshimatsu. It aired in Japan between January and March 2018 and was co-produced and distributed internationally by Crunchyroll. Mari Tamaki is a second-year high school student who wants to make the most out of her youth but is usually too afraid to do so. One day, she meets Shirase Kobuchizawa, a girl who has been saving up to travel to Antarctica, where her mother disappeared three years ago. Joined by two other girls, Hinata Miyake and Yuzuki Shiraishi, they join an expedition headed towards the Antarctic. A girl who attends Tatara West High School in Tatebayashi, Gunma. She is often called Kimari (キマリ) by her friends. She is always curious about things that she does not know. Despite her curiosity, Kimari realises she is not living life to the fullest and seeks to make the most of her youth by going on an adventure. One day she finds a misplaced one million yen, and seeking to return the large sum of money she soon encounters the owner and high school student Shirase. Attending the same high school they become close, and Kimari is brought into Shirase's confidence regarding her classmates plans to someday travel to Antarctica. She was impressed by Shirase's Antarctica plan and decided that they would go together, meeting her desire to enrich her youth with new experiences. She is a senior high school student attending the same high school as Kimari. A shy and quiet girl, she is also the daughter of Takako Kobuchizawa, an Antarctic observation crew member who went missing during her last expedition to Antarctica. Shirase has been dreaming of going to Antarctica in search of her mother, as she believes Takako is still alive and waiting for her. Most of her classmates make fun of her by calling her the Antarctic Empress and believing that she won't make it to Antarctica. Soon she makes friends with Kimari and confides in her Antarctica travel plan. Later the two meet Hinata and Yuzuki and form a group with the goal of journeying to Antarctica. A bright and friendly girl who works part-time at a convenience store near the high school where Kimari attends. She is the same age as Kimari, but she dropped out of high school and is now preparing to take a college entrance examination. Her dream is to ace the exams. She decided to join the expedition since she has two years left before taking her entrance examination, and she wanted to do something special. Prior to joining the group she watched Kimari and Shirase bond over their travel plans and became envious of both of them. However over time she comes to enjoy their company and honesty, something she found lacking in previous friend groups. She is a first-year high school student from Hokkaido, who has a calm and cool personality compared to the others. She is an actress who started in entertainment and commercials at the age of four and, due to her long business travels, has never had friends since she was a young child. She initially refused to go to Antarctica to do online streams about the trip, but later changed her mind after being convinced by Kimari, Shirase and Hinata. She is initially jealous of the other three girls friendship, but she later realizes that all of them are her best friends even though they had only known each other for less than a month. Commander of the civilian Antarctic expedition "Antarctica Challenge". She was also a member of the previous civilian expedition. A woman who serves as vice commander of "Antarctica Challenge" under Gin. She was also a member of the previous civilian expedition. So-called Antarctic chef who serves as the head cook of the observation team. She was also a member of the previous civilian expedition. The captain of the observation ship, the Penguin Manju Go. Assumed command of vessel at Gin's request. Previously captained an Antarctic observation team while a member of the SDF. Kimari's childhood friend and best friend from kindergarten. She became envious of Kimari after she decided to go to Antarctica. Kimari's sister who also serves as a school committee member at school. She is worried but supportive of her sister who is going to Antarctica. Mother of Shiraishi Yuzuki. She is also a manager of her daughter's works. Shirase's mother, who disappeared during an Antarctic expedition three years ago. The 13-episode original anime television series by Madhouse was first announced by Kadokawa during Anime Expo 2017 in July. The series is being directed by Atsuko Ishizuka with Jukki Hanada writing the scripts and Takahiro Yoshimatsu designing the characters. Yoshiaki Fujisawa is composing the music. The series aired in Japan between January 2 and March 27, 2018 and was simulcast by Crunchyroll. The opening theme is "The Girls Are Alright!" by Saya, while the ending theme is "Koko Kara, Koko Kara" (ここから、ここから, From Here, From Now On) by Inori Minase, Kana Hanazawa, Yuka Iguchi, and Saori Hayami. "One Million Yen For Youth"
Mari Tamaki, a second-year high school student who fears she has not been making the most of her youth, contemplates skipping school and going on an impulsive trip, but is too scared to go through with it. One evening, she comes across an envelope dropped by a girl, discovering it contains one million yen. The next day, Mari finds the girl who had dropped the envelope, Shirase Kobuchizawa, who had been saving up the money to travel to Antarctica and find her missing mother, Takako. Taking an interest in Antarctica herself, Mari decides to join Shirase on her journey. Needing money for a flight to Fremantle, where a civilian expedition towards Antarctica is scheduled to depart from, Mari begins working at a convenience store alongside co-worker Hinata Miyake. Having overheard Mari and Shirase's conversations, Hinata also takes an interest in going to Antarctica and joins in on Shirase's plan. Later, the girls go to Kabukichō, Tokyo to try and carry out a plan to sneak aboard the exhibition, only to get discovered by two of the team members, Kanae Maekawa and Yumiko Samejima. Despite offering the money she had saved up as sponsorship for the expedition, Shirase is unable to convince Yumiko and Kanae to let them come on the expedition, as they have their own plan to gather the funding needed. "The Follow Backs Don't Stop"
The girls are approached by Yuzuki Shiraishi, a child actress who had just been chosen to go on the Antarctica expedition as a reporter, who asks Shirase to go in her place. However, Yuzuki's manager and mother, Tamiko, is adamant about Yuzuki going as part of her job. As Yuzuki remains defiant, Tamiko proposes that if Shirase, Mari, and Miyake can convince Yuzuki to go on the expedition, they can accompany her. Asked why she does not want to go, Yuzuki explains how she never got to make any true friends because of her acting career, becoming surprised when Mari gives her a hug. The next day, the girls invite Yuzuki to hang out with them as proper friends, prompting her to agree to go to Antarctica as long as they come with her. Mari gets in trouble with her mother after she fakes her signature on a permission slip and is tasked with passing all of her tests. With the threat of studies looming, Mari and the others head to a summer training camp for the expedition, where they meet the team captain, Gin Todo. The girls first take part in a route mapping exercise where they must determine a route and place flag markers down. While spending their first night in a tent, Shirase explains how Gin went with Takako on a previous Antarctica expedition that the latter did not come home from. Early the next morning, Mari comes across Gin, who shows her the sunrise and tells her about what Takako was like. As the Antarctica expedition draws nearer, Mari's childhood friend Megumi Takahashi starts to act jealous towards her. On the day before the expedition, Megumi tells Mari that people have been spreading rumors of her, only for Shirase and Hinata to show up and take her to karaoke to blow off some steam. Afterwards, Mari tells Megumi of how she wanted to become strong so she would not have to rely on her all the time. The next day, Megumi reveals she had been the one spreading bad rumors about Mari and Shirase, realising she had been dependant on Mari relying on her. Rejecting Megumi's request to break off their friendship, Mari joins the others as they set off on the first leg of their trip. "Welcome to the Durian Show"
As the girls arrive in Singapore for a two-day layover before boarding their connecting flight to Australia, Hinata discovers that she appears to have lost her passport. With not enough time before their next flight to obtain a new passport from the embassy, Hinata accepts that she may have to miss out on the expedition altogether, much to Shirase's objection. The next day, as the girls find themselves unable to change their tickets for a later flight, Shirase offers up the one million yen she had saved to change them to business-class tickets so they can all go together. Later that evening, however, Shirase discovers that Hinata's passport was in her purse the entire time, as she had been holding onto it for her after coming out of customs while Hinata was tying her shoe, then forgot about it. With the travel situation resolved, Mari and Yuzuki punish Shirase and Hinata for all the trouble they caused by having them eat durians. "The Ship That Sees the Universe"
Arriving in Fremantle, the girls tour around the expedition ship to film a report before departure. While helping out the other workers, the girls begin to worry about how understaffed the expedition is and become curious as to whether Kanae is hiding some kind of plan from them. Later that night, Shirase speaks to Gin about how Takako disappeared and their drive to go to Antarctica once more. The ship finally sets off on its voyage, with Mari and the others tasked with various jobs alongside their report before training on deck to build stamina. The novelty of the journey soon wears off, however, as everyone starts feeling seasick, which only gets worse as the ship starts sailing through some fierce currents. While downhearted when comparing themselves to their more stamina-inclined shipmates, the girls cheer up when they get a first-hand taste of the waves and soon get used to riding a boat as it begins its approach towards Antarctica. "Antarctic Love Story (Blizzard Arc)"
One of the crewmates, Toshio Zaizen, reveals that he has fallen in love with Gin, asking Shirase for any information about her. Feeling that it might spice up their report, the girls decide to interview Gin to see if they can learn anything about her love life. Later, Gin, who has been worried that Shirase hates her after Takako disappeared, speaks with Shirase, who is herself conflicted about how to feel. Just then, the ship is forced to break through a large sheet of ice standing in its path, during which Gin recalls the last transmission she received from Takako. As Toshio ends up giving up on his crush, the girls finally set foot on dry land. The girls arrive at the Syowa Station where they will be stationed. As everyone gets the station ready, Yuzuki, who had just been offered a role for a drama, becomes curious about what point she officially became friends with the others. As the crew enjoys a Christmas party, Yuzuki becomes further confused about what friendship means when Mari cries after she proposes having Friendship Contracts. Later that evening, Mari tells Yuzuki about how she views her friendship with Megumi before everyone shows up for a belated birthday celebration, giving Yuzuki her first birthday with friends. As the girls receive video messages from their friends and families, Hinata acts strangely when some old acquaintances of hers call, after which Shirase spots her letting out her frustrations in private. Concerned about Hinata, Shirase gets caught looking at e-mail sent by Hinata's former teammates in the track club. Hinata explains that because of her talent, she was looked down up by the third-year members, who then spread bad rumors that led Hinata to quit school. While on a mission to set up solar panels and satellite markers, Shirase manages to give Hinata some comfort over her dilemma. The next day, as the girls prepare for a live broadcast, Shirase confronts Hinata's teammates over their actions, giving Hinata some peace of mind. Shirase is unsure how to feel when she is invited to join the others on a snowcat ride to where Takako was last heard from, fearing that there will be nothing left for her once she goes. After hearing Gin's reasons for coming to Antarctica despite knowing that Takako is dead, Shirase reminds herself of the effort she put in to earn the money she saved before deciding to join the others on their mission. As the team spend the night in the middle of a blizzard, Shirase hears from Gin about Takako's final words before Mari gives her her thanks for taking her to Antarctica. Upon arriving at a site for an observatory, Mari and the others search for proof that Takako was there, managing to find a laptop belonging to her. Logging onto it, Shirase breaks into tears as it retrieves all the e-mails she had sent to Takako that never got to be read. With their time in Antarctica drawing to a close, the girls decide to play a game of baseball with all the team members before they leave, after which Shirase decides to cut her hair. At their farewell party, Shirase gives a speech on her thoughts on Antarctica, making a promise to come again. As the girls take their leave, Gin discovers one final e-mail in Takako's outbox addressed to Shirase containing a photo she took of the aurora australis, which the girls get to witness themselves. Upon arriving in Japan and parting ways with each other, Shirase reveals she has left her earnings in Antarctica, while Mari discovers that Megumi has gone to the Arctic. A manga adaptation illustrated by Meme Yoimachi began serialization in Media Factory's Monthly Comic Alive manga anthology from December 27, 2017. The anime was selected by The Verge as one of the best anime of 2018, saying that it is "genuine", and by The New York Times as the #8 International Show of the Year, with TV critic Mike Hale describing it as "a funny and moving coming-of-age story that should translate across all boundaries of age or culture." It won the 'Anime of the Year' award in the 5th Anime Trending Awards and was also awarded for two more categories which include Best in Ensemble and Best Action or Adventure. Otaku USA praised the characterization and humor and added that "directing helps a lot of the comedic timing stand out and makes some of the more familiar punchlines feel fresh". ^ Even though 宇宙 is normally read "uchū", in this case it is read as "sora". ^ Subtitled A Story that leads to the Antarctica, also known in Japanese as Yorimoi (よりもい). ^ "A Place Further Than the Universe Anime Listed With 13 Episodes". Anime News Network. January 9, 2018. Retrieved January 9, 2018. ^ Loh, Johanthan (February 9, 2018). "This Japanese anime's unbelievably accurate depictions of Singapore will blow your mind". Business Insider Singapore. Retrieved March 30, 2019. ^ Villanueva, Michelle (January 16, 2019). "A PLACE FURTHER THAN THE UNIVERSE WILL GIVE YOU ALL THE CITIZEN-SCIENTIST FEELS". Syfy Wire. Retrieved March 30, 2019. ^ Brodgon-Johnson, Sky (July 29, 2018). "A Place Further Than The Universe- An Expedition Forward and a Journey Within". Odyssey (publication). Retrieved March 30, 2019. ^ D'Anastasio, Cecilia (March 30, 2018). "A Place Further Than The Universe Is A Wholesome Look At Female Friendship". Kotaku. Retrieved March 30, 2019. ^ a b c d e "A Place Further Than the Universe Reveals Video, Character Designs, Cast, Staff". Anime News Network. November 8, 2017. Archived from the original on November 9, 2017. Retrieved November 8, 2017. ^ a b c d e "CHARACTER｜TVアニメ「宇宙よりも遠い場所」公式サイト". yorimoi.com (in Japanese). Retrieved 2018-03-02. ^ a b c d e f g "A Place Further Than the Universe Reveals More Cast, January 2 Premiere". Anime News Network. December 13, 2017. Archived from the original on December 13, 2017. Retrieved December 13, 2017. ^ a b c d e f ""A Place Further Than the Universe" Adds 6 More Antarctic Adventurers". Crunchyroll. February 3, 2018. Retrieved February 4, 2018. ^ "Kadokawa Announces Girls' Last Tour Anime & Original Anime Project (Updated)". Anime News Network. July 3, 2017. Archived from the original on July 29, 2017. Retrieved July 6, 2017. ^ Barajas, Quito (October 8, 2018). "The Girls' Friendship in 'A Place Further Than the Universe' Is Pretty Damn Real". Reel Rundown. Retrieved March 30, 2019. ^ Conville, Caitlyn (May 31, 2018). "In 'A Place Further Than The Universe,' Mari Inspires Travel And Friendship". Study Breaks. Retrieved March 30, 2019. ^ "Crunchyroll to Stream The Rising of the Shield Hero, A place further than the Universe Anime". Anime News Network. July 4, 2017. Archived from the original on July 8, 2017. Retrieved July 6, 2017. ^ "A Place Further Than the Universe Anime's Ad Previews Ending Theme". Anime News Network. December 28, 2017. Retrieved January 9, 2018. ^ "A Place Further Than the Universe Original Anime Gets Manga". Anime News Network. November 27, 2017. Archived from the original on November 27, 2017. Retrieved November 27, 2017. ^ Moore, Michael (February 5, 2019). "THE BEST ANIME OF 2018: AN ONGOING LIST". The Verge. Retrieved March 30, 2019. ^ Poniewozik, James; Hale, Mike; Lyons, Margaret (December 3, 2018). "Best TV Shows of 2018". NYTimes.com. Retrieved January 1, 2019. ^ "Official Winners - 5th Anime Trending Awards". Anitrendz.net. Retrieved March 4, 2019. ^ Goldstein, Michael (July 28, 2018). "Baby, It's Cold Outside". Otaku USA. Retrieved March 30, 2019. This page was last edited on 30 March 2019, at 14:02 (UTC).